This is a tour for those of us who would like to get off the beaten trail and experience visiting Rome like few do. 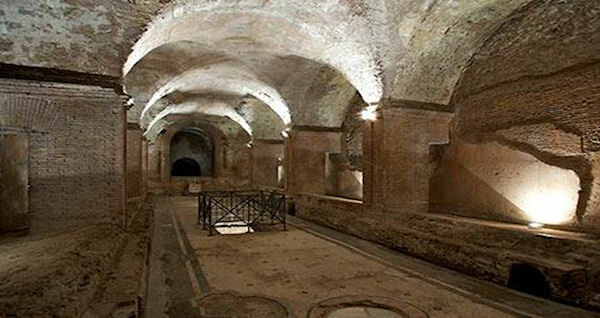 You will visit some of the most interesting areas of the “Underground Eternal City” we will show you the most challenging as well as the biggest undiscovered museum in the world. A series of layers, made of debris, buildings, insulate, temples, shrines, etc., all one on top of the other, due to changes and developments that have happened during the past 3000 years which have made Rome the Caput Mundi (the head of the world). We will visit the Mamertine Prison, Temple to Mithras, Caracalla Baths and much more before we move on to our next site. We will see the Colosseum from the outside, a few go in and experience the interior, fewer still get to experience the limited access this VIP tour includes taking you to the underground and the upper levels on the 4th floor. You can close your eyes and you are back at the time when the Colosseum was full of people here to enjoy the day. You will get an experience few do with access to these limited access areas of the Colosseum. The Forum was the center of it all, enjoy a guided tour through the site with someone that can give you the history, show you the sites and take your picture in front of one of the sites. You will enjoy a tour through the various areas of the forum, learn the history and marvel at how people lived at the time Rome was the center of the world. This is a walking tour so make sure to have on your walking shoes. The three sections of this tour may operate in reverse order depending on the day. You will have time for a lunch break. Please note this tour will require a lot of walking.